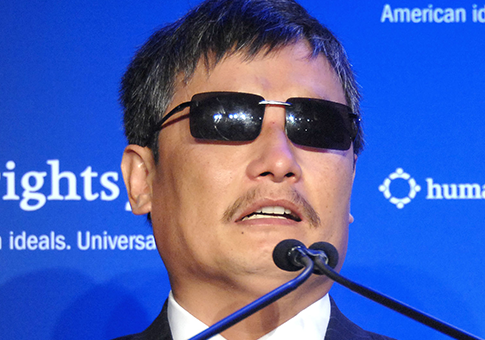 Blind Chinese legal activist Chen Guangcheng said Sunday that China’s Communist leadership is exerting more influence on U.S. universities than many people realize, threatening academic freedom. Guangcheng said New York University is bowing to pressure from Beijing by asking him and his family to leave university housing by the end of June, the China Aid Association reports. The Chinese leadership began pressing university administrators to secure his exit as early as last August. ChinaAid founder and president Bob Fu, who has long championed Chen's cause, confirmed his observation of Chinese government pressure on U.S. academia, saying, "American universities are out chasing the China dollar and are very reluctant to work with dissidents who have a strong voice in China. It does not always have to be direct pressure from Beijing, there is also self- censorship, particularly if a college president believes their China campus or the future enrollment of Chinese students will be sabotaged." Fu expressed dismay that these American universities are not living up to their reputation among Chinese. "This is unfortunate because U.S. institutions that welcome dissidents are seen as havens of religious freedom and free speech and will be more attractive to Chinese young people who can't experience these freedoms at home." But, he added, "The Communist Party may have political control, but it does not control the hearts and minds of the Chinese people, who still look to the United States as a shining example of freedom, democracy, and the rule of law. Hopefully, Chen's experience with NYU will not dim that view." This entry was posted in National Security and tagged Chen Guangcheng, China, University. Bookmark the permalink.